We are all internally motivated sometimes to do the right thing or try hard. But at other times, we need external motivation: a bonus from our employer, a hug from a friend, a smile from a child. It doesn’t take much, frankly, and even small rewards can brighten our day and keep us going in the right direction. Our children and students are no different. Using rewards at home and in class can help children focus on their studies, achieve more academically, graduate on time, and become more productive members of society. The research on this is very clear and not controversial. It’s also just plain common sense. 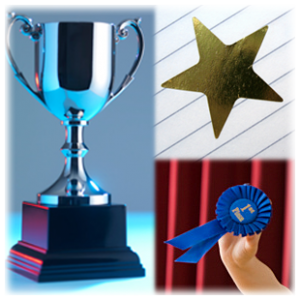 Have you used rewards at home or in the classroom to bring out the best in a child? We’d love to hear your story! And, because we know a little external motivation goes a long way, once a week in January 2015 we’ll send a $25 Amazon gift card to the person whose story has attracted the most “likes.” So tell us your story below, and then be sure to share it with family and friends! January 12 update: Congratulations to Meredith Marshall, the first-week winner of a $25 Amazon gift card! I have to say rewards don’t work for my kids. Sure, they work in the short run but I’ve seen few long term gains. For ex: In thirds grade the teacher gave extra pts for “challenge math” and now in fourth grade my daighter said she doesn’t want to do them without a reward. My kids won’t do anything extra unless there is a reward. I think rewards have ruined my kids inate desire to learn. Sorry, not what you wanted to hear. My son is currently in first grade. He’s a typical American boy who loves to play, watch cartoons and laugh. He loves school and loves learning new things, but homework is maybe 7th or 8th on his “Top Ten List” list of things he enjoys doing. When motivating him to do his homework is particularly challenging a strategy my wife and I use is to reward him with an extra half hour of cartoons on Saturday if he does well on his homework. Not surprisingly it works. Rewards work for even the youngest students and I think we all have either received them or used them as motivation to go the extra mile. I remember being in the 5th grade and participating in math contests to better learn our multiplication tables. The contest was called the Magnificent 7…completely made up by my 5th grade teacher, Mr. Legan. I remember how hard it was to remember my multiplication tables and the contest was all about the seven students in the class who could recite theirs the fastest. I would always make 3rd and 4th place until the day my teacher said the 1st place winner will receive extra credit points and candy. At that time in my life, the only thing better in school than extra credit points was candy! Needless to say, I won 1st place that day of the math contest. I will never forget how proud of myself I was that day. Even more importantly, how great that candy tasted, too! Rewards do help children learn! And as a parent, I realize offering incentives to my children is the greatest way to get positive results. I remember being told by our 6th grade Principal, right before the beginning of second semester, that there would be an end-of-the-year field trip to Six Flags Great America for the whole class! The caveat, however, would be if any student had so much as ONE missing assignment in any of their classes, they would be ineligible to go. I also remember being mildly intimidated about such a hardline proposal. Especially because organization-wise I was a mess at that time. Particularly when it came to remembering off the top of my head what assignment from what class was due when. Facing enhanced incentives, I streamlined my organizational skills, and started writing down my assignments in a calendar, rather than just trying to rely on memory. I successfully handed in all my assignments on time and boosted my grades as a result. Judging by my new studious habits and higher grades, I thought when it came time for the field trip, I was going to mostly just see the “smart kids.” Wrong. Many of the most notorious troublemakers in that school also reformed their ways and made it on the trip as well! I can only imagine how differently that whole semester could have turned out for me and everyone else if my school had never decided to use rewards. A very long time ago, but still in my memory, I was given a specific number of raisins as a reward for correct answers in P.S. 173 Manhattan first grade by the school teacher. During my high school years, the Jesuit fathers would award gold, silver, or bronze honors cards at the end of each term in each of curriculum subjects. My mother kept the ones I had earned, as I discovered amongst her effects at her death.